I never joined the school newspaper. 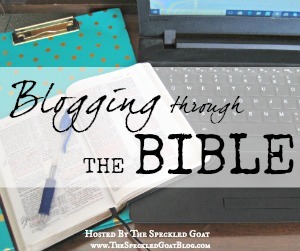 I was never part of the literary club in college, I've never been to a meeting of my local Christian writers' group, and my book idea is still sitting in a worn out green notebook collecting dust in my nightstand. Because what if my writing is terrible, what if no one cares about what I have to say, what if I can't think of anything to write about? What if I'm not interesting or insightful or smart? What if I'm just plain wrong? God has called me to a lot of opportunities to use the gifts and passion He's given me, and more often than not, I fail terribly at them because I'm afraid to fail. I'm afraid to fail, and so I don't try. I'm pretty good at failing at that, too. I don't know about you, but I often feel like I have no idea what I'm supposed to be doing as a disciple of Christ. And I don't want to fail... so I often don't engage at all. Jesus called me out, made me his own, and... I flail through life without much purpose, I so often feel directionless, I let my preconceived ideas and prejudices get in the way of his kingdom, I focus on the wrong things more often than I lean into my mission. The encouraging thing is, I'm not alone in that. I mean, the Gospel of Mark is chock full of disciples screwing up, misinterpreting Jesus, being selfish and misguided... and they were in the physical presence of Jesus! Just like the Twelve, Jesus called us. He wants us. He chose us. That's what it's all about. As disciples, we have the same three purposes. We have to start at the source (being with Jesus), then we have to go and do the risky things- loving the world with strength and wisdom and compassion. But here's the thing-- to do what God called me to do, I have to actually do something. I can't be the disciple who doesn't do anything. I have to spend time in the Word and in prayer, I have to actually leave my comfortable bubble of home and family and nothing else and venture out into the unknown and the lost and the hard to love. And the scariest thing of it all? Actually, I'm pretty sure I will fail. But I have to decide- is a faith that's growing and transforming and powerful more important that my fear of failure? More important than staying safe and comfortable? The three purposes Jesus laid out for his apostles were to abide, teach, and heal. He didn't say anything about perfection. And in fact, his Twelve were pretty terrible at all three. They messed up a lot. A lot a lot. They were failing followers. But they stepped out, they followed in spite of their failings, and Jesus didn't kick them out of the group or tell them they weren't welcome anymore. He gave them grace in the failings, and taught them, led them to be better. And in Mark, we have their examples- granted, mostly bad examples- to learn from. I want a growing, vibrant faith, even if that means messing up spectacularly. Even if that means doing scary things. 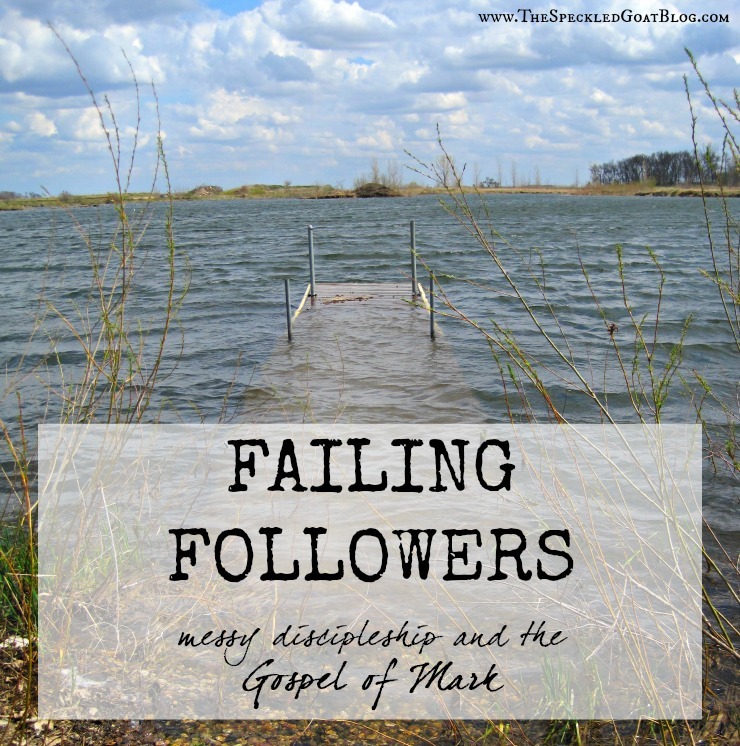 And that means learning to do this discipleship thing, knowing full well that I will be a failing follower. This post is part of a (brand new!!) link up! It can be so hard to start when we are afraid of failing- you're right! And I struggle heavily with the idea of not being safe. But God never promised us safety on earth. He promises us safety in his arms, but I often forget that that's often very different than an earthly safety. This is exactly how I feel about learning watercolor. I want to learn, but at the same time I'm afraid to fail. Is watercolor critical to my walk with Christ? Not really, although it could simplify my greeting card ministry if I could make watercolor cards instead of photo cards. But I think the bigger lesson the Lord wants me to learn is that my fear of failure is a sign of pride. He doesn't really care whether I learn how to paint, but He does care that I learn humility. Thank you for your wonderful devotion from Mark, and for organizing this joint Bible study. It is amazing what happens when we take that first step out in faith and allow God to take our weakness and fear...turning it into something wonderful for Him. He shows His strength in our weakness. I've found times when a totally unexpected door has been opened for me to talk about the Lord to an unbeliever and He uses my voice to tell them what He wants them to hear. It is definitely NOT my comfort zone or gift, but He can do all things through a willing vessel.